Whether you have a connection to the sea yourself or whether you’re looking for the perfect gift for the surfer, sailor or adventurer in your life, we have you covered with a truly special collection of handmade nautical bracelets. 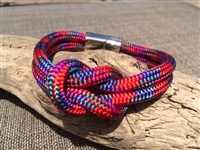 These stunningly unique items are made in the USA from authentic maritime ropes and lines, so you can feel connected to your love of adventure no matter where you go. 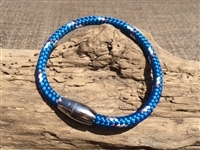 Our bracelets come in a variety of colors and styles that reflect the vibrancy of a day spent outside or on the water, and are stylishly versatile enough to look great on men, women, and kids. Crafted in a classic sailor knot bracelet design, each piece in our inventory brings to mind something special about boating, the open water, or the great outdoors. 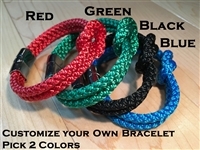 WaterLine by Design’s climbing rope bracelets and sailors’ bracelets make great gifts for surfers, boating enthusiasts, travelers, and more. Whether you choose a single solid-color bracelet with a simple knot or stack several different bracelets together, our eye-catching collections are sure to draw attention. Finding the perfect gift or the most stylish way to express your own love of adventure has never been easier. So shop all of our striking nautical bracelets today and sail into summer with free shipping! Copyright © 2013 WaterLine by Design. All Rights Reserved. Built with Volusion.